David Uhl is proud to present a full lineup of events at the Uhl Gallery – Destination Daytona and Uhl Works Patio – Beach Street Harley-Davidson during Daytona Bike Week. Cris shares a very special passion with me – a love for the romance of the history of women on motorcycles. David Uhl is proud to present a full lineup of events at the Uhl Gallery – Destination Daytona and Uhl Works Patio – Beach Street Harley-Davidson during Daytona Bike Week. The week kicks off with David Uhl, Cris Sommer-Simmons and Pat Simmons signing limited-edition giclee prints of David’s latest masterpiece, “Leading Ladies,” and Cris’s new book, “The American Motorcycle Girl's Cannonball Diary,” along with a solo acoustic concert by Pat. During the week, visitors can also meet Gloria Tramontin Struck, David’s new “Woman of Harley,” and other Great Women of Motorcycles. Tuesday, March 13, 11:00 a.m.
David Uhl, Cris Sommer-Simmons & Pat Simmons sign Cris’s new book and David’s giclee print. Meet Gloria Tramontin Struck, David’s new “Woman of Harley-Davidson”. Special appearances by Laura Klock and Jodi Perewitz. Wednesday, March 14, 2:00-3:30 p.m.
Cris Sommer-Simmons & Gloria Struck at the Uhl Patio, Beach Street H-D.
Wednesday, March 14, 6:00-9:00 p.m.
Meet the Great Women of Motorcycles, Cris Sommer-Simmons, Gloria Struck, Laura Klock & Jodi Perewitz at Uhl Patio, Beach Street H-D.
Thursday, March 15, noon-2:00 p.m. and 6:00-8:00 p.m.
Friday, March 16, 2:00-4:00 p.m.
David Uhl painted “Leading Ladies” last year, but waited to release it until Cris had completed her Cannonball book. The idea for his portrait of her came from the Motorcycle Cannonball Run 2010, where Cris was the only American woman to participate. Her 20th place finish paid tribute to her idol and the namesake of her 1915 Harley-Davidson, Effie Hotchkiss, who became the first woman to ride cross country in 1915. Sought after by various museums and collectors, David felt that this original oil painting rightfully belonged in the possession of Cris and her husband Pat. An exclusive edition of canvas giclee Leading Ladies prints is now available. Each is hand-numbered and signed by artist David Uhl, Cris Sommer-Simmons and her husband Pat Simmons (of Doobie Brothers fame). Further personalization of your print and photo opportunities will be available at a series of events during Daytona Bike Week 2012. Only 103 canvas prints will be available to the public 89 prints – (the year Cris met Pat and the number on her 1915 H-D), plus 9 Artist Proofs and 5 House Copies. Image size is approximately 30 x 20 and the opening price will be held at $1,550 unframed (framing extra) through the end of Bike Week (March 18th) or until the edition sells out. Those interested can call 303-913-4840 to take advantage of a pre-show special price of $1,395 while the edition lasts. Those who order prints by March 18th also receive a signed edition of Cris's new book, "The American Motorcycle Girl's Cannonball Diary" which features Leading Ladies as the cover art. Uhl has also released his 2012 Daytona Commemorative piece, “Above the Law,” the eighth in a series. Prints are available through the end of this year’s rally (March 18). Edition numbers will be assigned as orders are taken and matching numbers are available for those collecting the entire Daytona series. Shipping is included with the purchase price within the continental US. Print comes framed with certificate of authenticity. Check out Uhl Studios’ fine art at Destination Daytona and Uhl Works apparel at Beach Street Harley-Davidson. You can visit Uhl Studios online at http://www.uhlstudios.com or Uhl Works at http://www.uhlworks.com. Uhl Studios is a fine art gallery located in Golden, Colorado. Uhl Studios specializes in motorcycle and aviation art and designer apparel. Uhl Studios fine art is officially licensed by Harley-Davidson. Uhl Studios was formed in 1997 when David Uhl’s fine art skills and Danial James’ illustration talents were fused together. 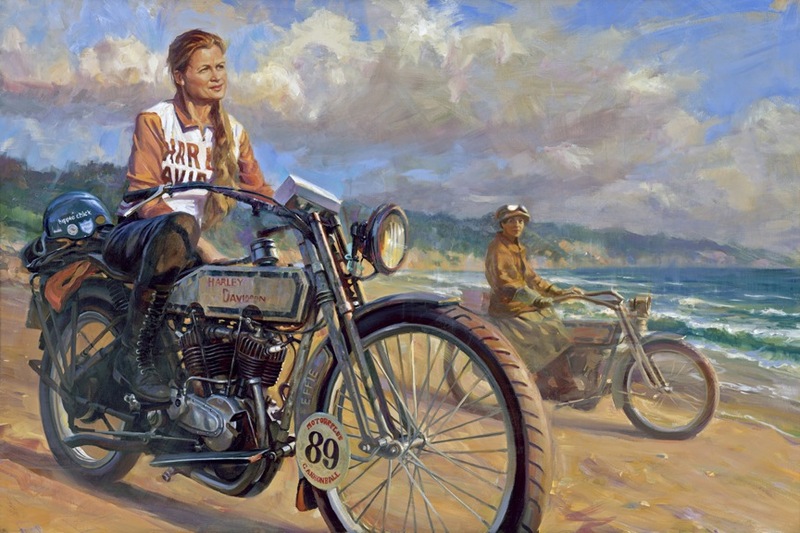 David Uhl is recognized for his unique style and vintage motorcycle paintings. His artwork is displayed throughout the world, and sought by prominent art collectors and celebrities alike, including Jay Leno, Steven Tyler, and U2. CBS Sunday Morning with Charles Osgood referred to David as “The Norman Rockwell of Harley-Davidson artists.” Danial James creates award-winning visual solutions for a wide array of national and international clients, including Coca-Cola, IBM, FedEx, and Coors. Uhl Studios now offers an exciting line of designer apparel “Uhl Works,” individually created by David and Danial.